The International Rock Climbing Researchers Association (IRCRA) held their biennial meeting on Telluride (CO), this past August. I was honored to be asked by this esteemed group to provide a keynote address on my training programs and application of the latest research. In my previous research post I presented a summary of three excellent research presentations on finger flexor training. 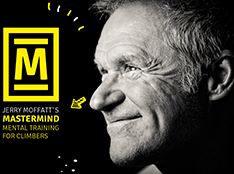 Now, in this second of the three-part research series, I’ll give you a glimpse into my keynote talk which included a section on energy system training as well as a presentation of some of my own research data on this topic. The subject of energy system training is cutting edge stuff, and it’s certainly far from being settled science. There’s some ongoing research and, I believe, a few interesting/significant breakthroughs are on the way when it comes to elevating the effectiveness of forearm muscle training. I’ll have more for you in the coming months and years—stay tuned here! Here’s a grossly abridged version (just 5 of 25+ slides) of my Keynote address at the August 2016 IRCRA Symposium. 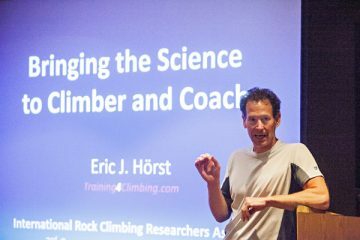 The focus of these slides is a primer on energy system training/programming, as covered in depth in the new 3rd edition of my Training For Climbing book. Slide #1 presents my Hierarchy of Training Specificity. The foundation (1st tier) is, of course, climbing as training—after all, climbers must firstly become effective, highly skilled, and economic at moving over stone. 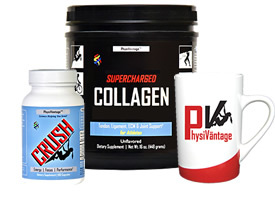 As motor programs and movement patterns are grooved, it becomes increasingly important to do some supplemental climbing-specific training of the agonist muscles groups as well as targeted training of the antagonist and stabilizer muscles (2nd tier), which are commonly overlooked and often much weaker than the agonists. More advanced climbers must train critical limiting constrains (finger flexor strength, pulling power, etc) with highly specific isolation exercises (3rd tier) to break through performance plateaus that commonly develop after several years of climbing. 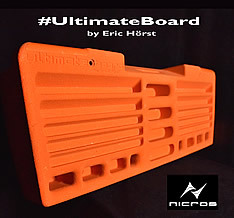 Finally, advanced to elite climbers need a highly nuanced and personalized program in order to eek out further gains via energy system training (4th tier). Putting the complete training-for-climbing puzzle together is difficult, but it’s a challenge that must be embraced with intellect and perseverance if a climber is to reach their genetic potential. 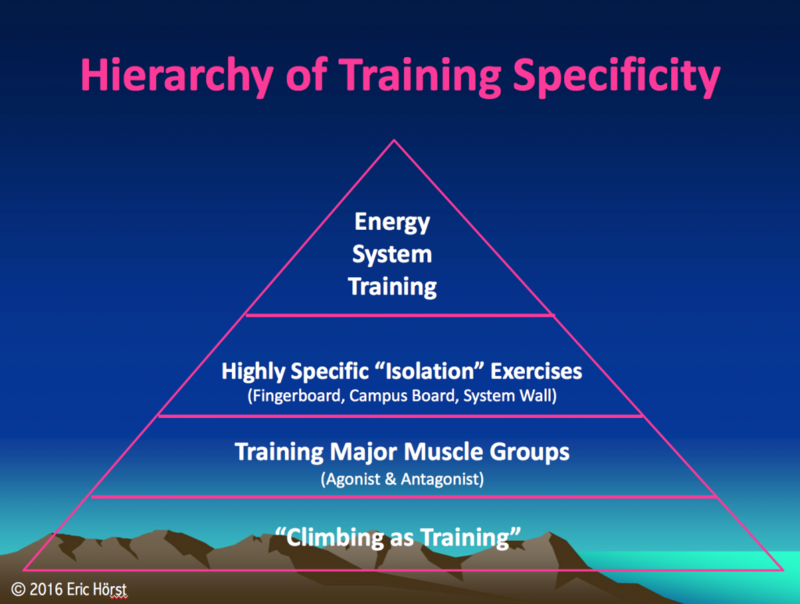 Hierarchy of Training Specificity for Climbers. 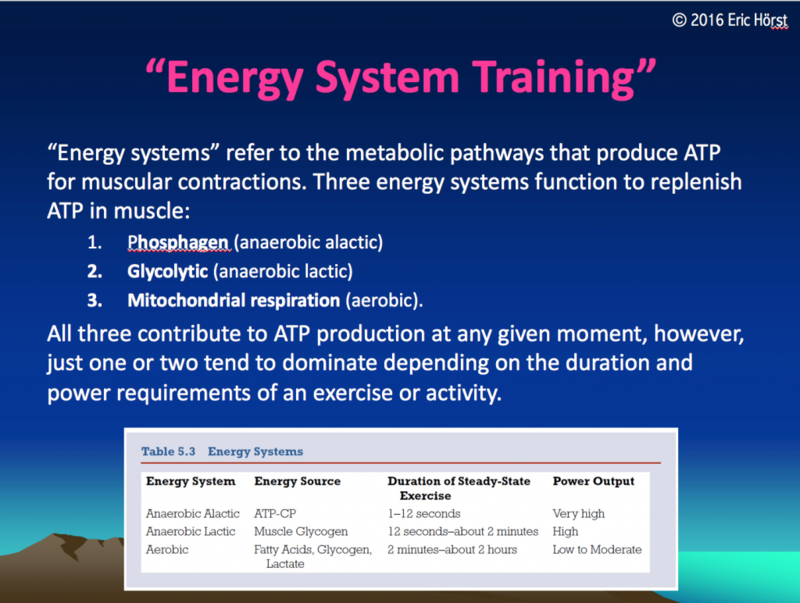 Slide #2 describes the three energy systems that produce ATP for muscular contraction, including Table 5.3 from Training for Climbing (3rd edition). Overview of the three energy systems. 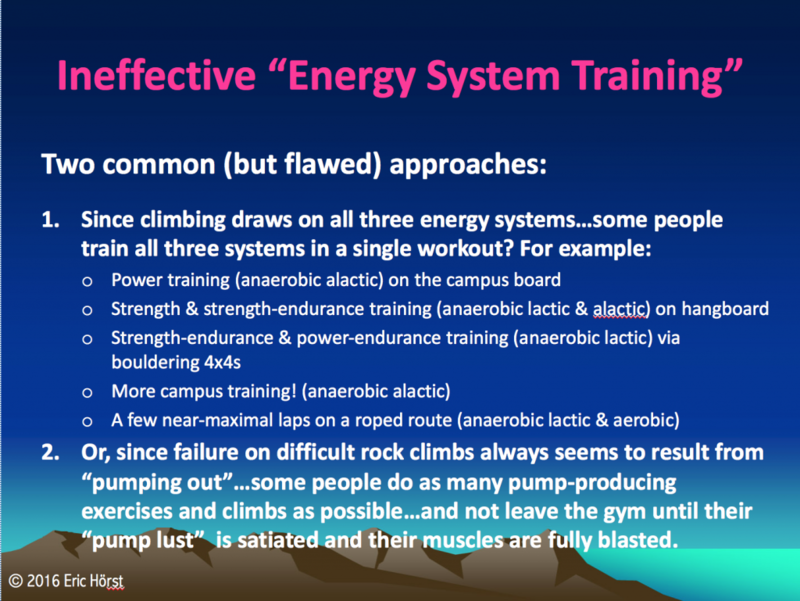 Slide #3 presents two very common—but flawed—strategies for “energy system training.” Don’t train this way! Poor/ineffective energy system training workouts. 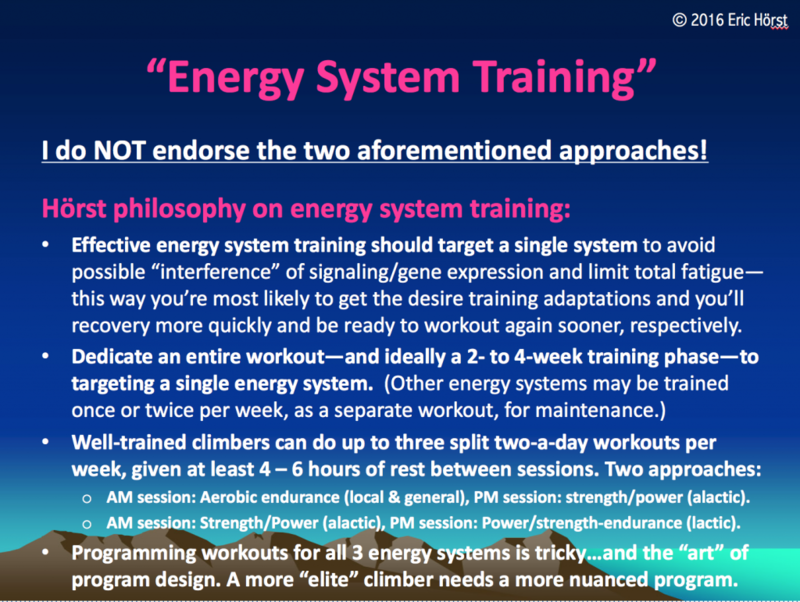 Slide #4 provides insight into my approach to energy system training/programming. Hörst philosophy for energy system training. 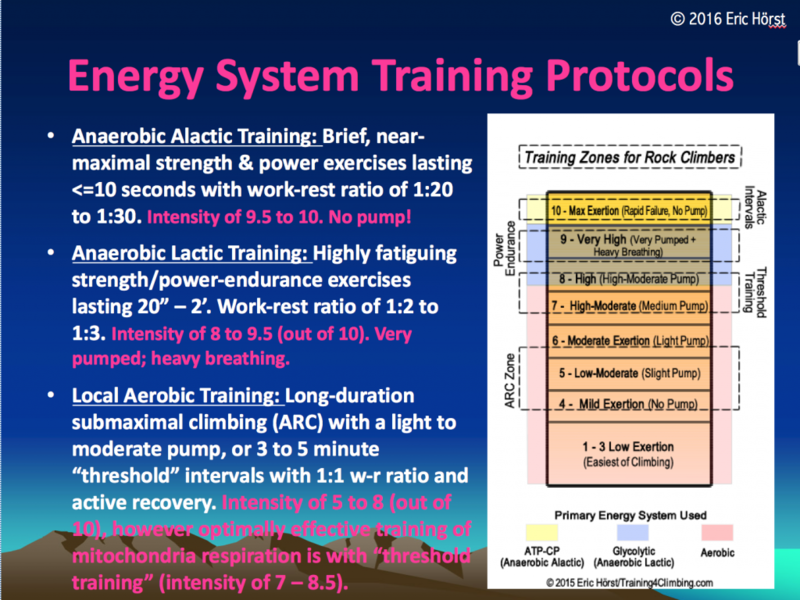 Slide #5 presents training protocols for targeting each energy system. Exercising at the correct intensity is critical—use of my “Training Zones for Rock Climbers” subjective exertion scale (shown below) will help you get it right. It’s also vital to take the correct rest intervals. Training volume is scaled according to the climber’s capacity, current microcycle/mesocycle design, and upcoming performance climbing or competition schedule. 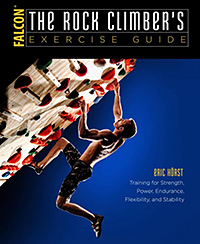 Energy system training protocols & training zones for climbers. 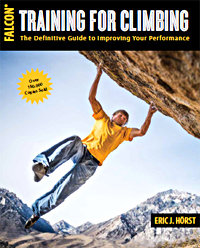 Learn more about energy system training, appropriate exercise selection, use of the Training Zones for Climbers exertion scale, and much more…in the 3rd edition of Training for Climbing!